I had the nicest Thanksgiving week, thanks so much for your best wishes, I hope you had a great week too. So as several as you suggested, I've been unsewing my Starlight blocks a few at a time. I'm making progress and have just a small stack left to go. I still need to trim the blocks and figure I"ll do that all at once. I'm not going to press and trim these blocks, I'm gong to cut new ones. That's just some Moda Bella Solid that I buy by the bolt, I figure at $6 per yard that's the most efficient way to go. So while I finish trimming my Starlight blocks I figured I would start something new, a Christmas something. I like to make Christmas quilts in December, in 2009 I made Oh Christmas Tree (LQ# 53), 2010 I made Red, White and Wonderful (LQ#64), in 2011 I wrapped up my FQS Kate Spain Mystery BOM (LQ#)71, and last year I made Vintage Holiday (LQ#100). 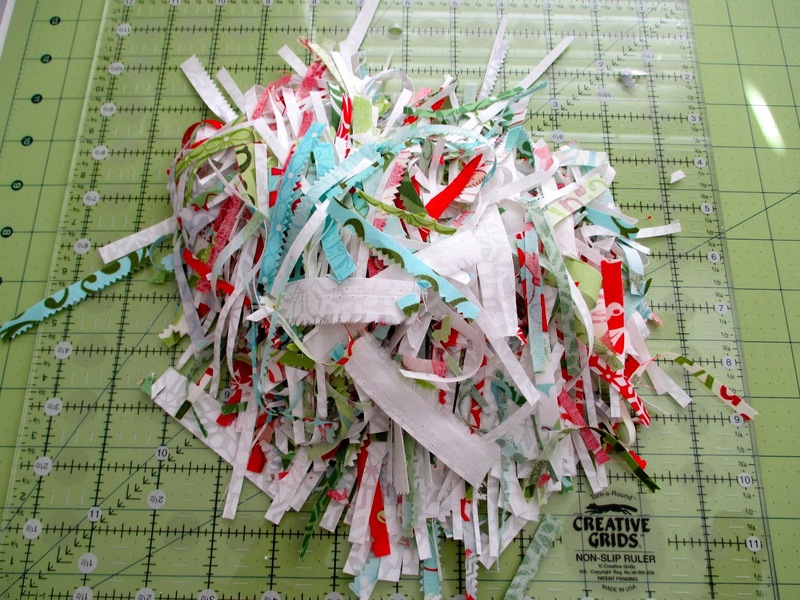 This is the start of Round & Round by Camille Roskelley for thimble blossoms. My half square triangle units are trimmed and ready, I'm hoping to make some blocks this week. The fabric is by Kate Spain for Moda. I plan to attack my Christmas To Do list this week, so sewing time will be scarce. I did get a start on my decorating this past weekend. 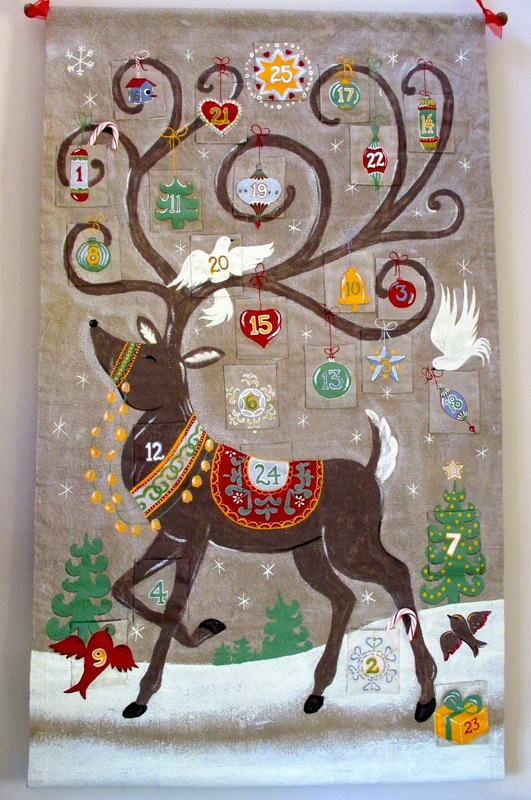 Here's something new for my house, an advent calendar. This came from Pottery Barn, is hand painted canvas, and huge. Those numbered pockets are a great size, perfect for giant chocolate bars, but I figure if I filled those pockets with chocolate bars they wouldn't make it a week, let alone a month. So I'm going to do my advent calendar in reverse, and add a candy cane to each pocket each day. Once it's Christmas my wall hanging will be full of pretty candy canes instead of empty candy bar wrappers. Even though this is a very busy time of year, it's my favorite, let the fun begin. Great to have you back...my coffee was sure lonely! :-) Round and round will be beautiful. Anxious to see your Round and Round. Love the advent calendar and your candy cane idea. Glad to hear you have a solution! I can't wait to see the quilt. Oh...that Advent calendar is just adorable and love your idea of filling instead of emptying out! ...then do you get to have the candies? 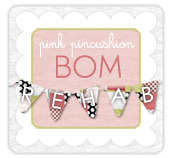 Glad to see you back online and happy sewing! I look forward to your posts and seeing what you are up to. The advent calendar is wonderful...I'm all for the chocolate myself. :>) Which Bella white do you use? Snow? White? Natural? I love that Advent Reindeer! I like your new project. I have been trying to get to that since this summer. I seem to be accumulating HST's! I can't wait to see your start... which no doubt will be a finish in a blink of the eye! (I think you have sewing elves that help you)! 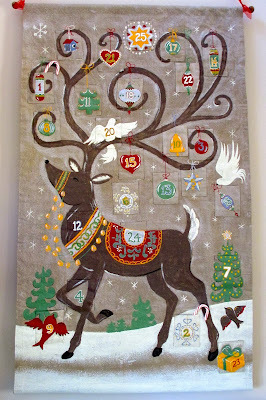 I love your new advent wall hanging so much I will have to run over to my neighborhood Pottery Barn to see it in person - it looks amazing on your wall. Your idea of adding a candy cane each day is much more of a slimming idea than the giant chocolate bars & much more cute. Can't wait to see how your Starlight looks with all those bright colored triangles it will definitely be a quilt that will brighten your day & wake you up in a good mood. 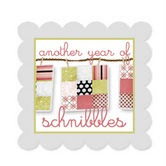 I next year I need to work on adding more fresh colors and more solids. See I am learning to set goals & plan from you which is a good thing. I'll be waiting to see what Christmas project you decided to do this year. I.m watching/listening to the new Celtic Womens' Christmas Concert on TV and sewing away on my Nantucket 4 patches. Happy, happy, happy!